Once a year Wiarton Willy puts Wiarton Ontario on the map for many more people that Sunday drivers in Cottage Country. The Wiarton Willie Festival has grown from its origins in 1956, from a small gathering at the pub and a misunderstanding into a week long festival. The original Willy died in 1999 but his predecessors, referred to as Wee Willy continue the Groundhog Day traditions. 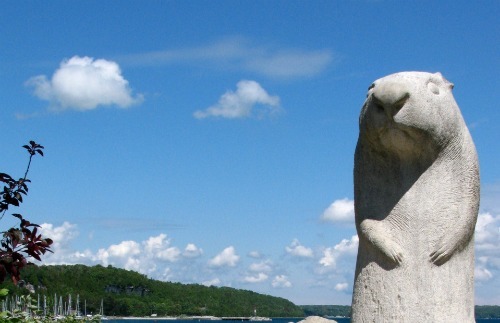 What sets the Wiarton Willies apart is the fact they are white or albino groundhogs. Willy is actually a late comer to the festival, making predictions since 1980 until his death. The original predictions were made by a trio of fictitious groundhogs, Grundoon, Muldoon & Sand Dune. The original story of the beginnings of the annual Winter festival in Wiarton are humble, even comical. It is said that Mac McKenzie sent out a press release to invite his friends to Wiarton for a Ground Hog Day celebration in 1956. When the Toronto Star caught wind of the event they sent a lone reporter who was surprised to find that no one in the town knew about the so called "festival". The Star reporter was directed to the hotel and found Mac and his friends partying and joined in the fun. But the next day he mentioned that he couldn't go home empty handed, so they staged a groundhog day photo op with McKenzie's wifes winter hat. This misunderstanding has now grown into the largest winter festival in Southern Ontario with ten thousand plus visitors. It has also been twice named one of the "Worlds Greatest Events but a Seattle based website and is marked by concerts, hockey games, a pageant and even crowning a king & queen of the festival. The festival runs from February 1st to the 6th, with February second drawing media from all across Ontario and the predictions replayed internationally. Return HOME from Wiarton Willy.